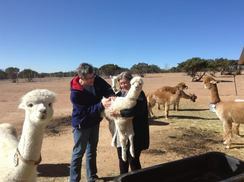 Que Sera Alpacas: Blog: Do You "Speak Alpaca"? We laughed, and I admitted that I do feel like part of the herd. But I was curious as to why she felt that way. Susan proceeded to describe a previous visit. It was a day the ranch was not open to the public, and I had allowed several of the females out of their pens to "mow" the grass around the parking lot. I was herding the girls back to their pasture when Susan arrived. I quickly realized that a few alpacas were missing, discovering then that one of the barn doors was open just a crack. It happened to be a part of the barn where we keep the alfalfa. Alfalfa is a real treat for alpacas, and at Que Sera Farm we use it primarily to entice them from one area to another. When I opened the door all the way, sure enough...I had found my missing girls. I shooed them all out. "Everybody out of the pool,” I said, and they dutifully--and somewhat sheepishly--filed out and headed back to where they belonged. Susan thought it was all quite marvelous and her friend looked somewhat amazed. The fact is that alpacas are extremely intelligent and are not difficult to train. All you have to do is convince them that there IS a good reason for them to do what you want them to do and that they can trust you not to get them into trouble. Piece of cake! ARE YOU LOOKING FOR A FUN EXPERIENCE THAT'S A LITTLE OUT OF THE ORDINARY? HOW ABOUT A VISIT TO A WORKING ALPACA RANCH? Meet the babies (we call them cria) laugh with the Jr. Varsity boys as they work out their new plays. Visit our fiber processing area ... and of course there's Broonie, our kissing alpaca! You'll love meeting sweet Broonie. Call ANNE: 505-310-3369 to arrange an appointment.